LOUISVILLE, Ky. (Monday, April 30, 2018) – In what is believed to be a Churchill Downs first, the winners from the previous year’s Kentucky Derby and Kentucky Oaks will be returning to run under the Twin Spires a year later on Derby Weekend. 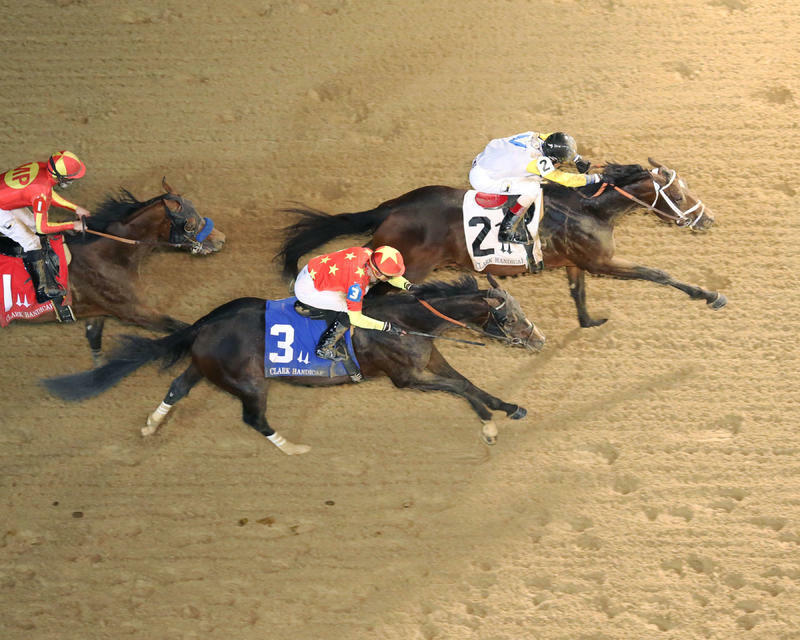 Brooklyn Boyz Stables, Teresa Viola Racing Stables, Siena Farm, West Point Thoroughbreds, MeB Racing Stable and St. Elias Stables’ Kentucky Derby winner Always Dreaming will face seven rivals in the $400,000 Alysheba Presented by Sentient Jet (Grade II) and China Horse Club International and Clearview Stable’s Abel Tasman tops a field of eight for the $350,000 La Troienne Presented by TwinSpires.com (GI). The Alysheba and La Troienne are two of six graded stakes that day which is highlighted by the 144 th running of the $1 million Longines Kentucky Oaks (GI). First post time Friday is 10:30 a.m. (all times Eastern). Other stakes on the Friday program are the 63rd running of the $200,000 Eight Belles Presented by Kentucky Trailer (GII) for 3-year-old fillies going seven furlongs on the main track, the 34 th running of the $200,000 Edgewood Presented by Forcht Bank (GIII) for 3-year-old fillies going 1 1/16 miles on the turf and the 24 th running of the $200,000 Twin Spires Turf Sprint Presented by TwinSpires.com (GIII) at five furlongs. 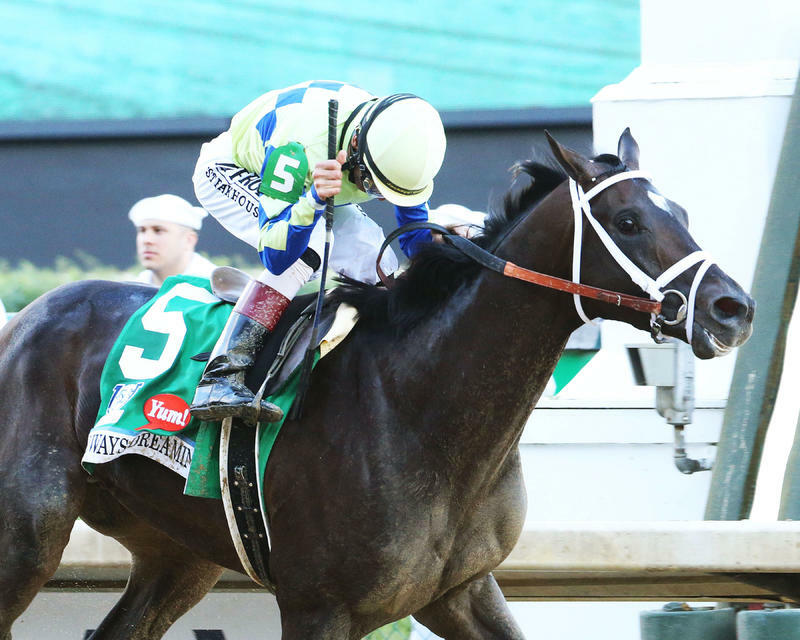 Always Dreaming, who came off a seven-month layoff with a second-place finish in the Gulfstream Park Hardacre Mile (GII), makes his Churchill Downs return in the 15 th running of the Alysheba for older horses going 1 1/16 miles on the main track. The Alysheba will go as the eighth race with a 2:53 p.m. post time. The most recent Derby winner to return the following year on Derby Weekend was Go for Gin, who finished third in the 1995 Churchill Downs Handicap (GIII). Trained by Todd Pletcher, Always Dreaming returned to the Churchill Downs work tab last Friday with a half-mile work in :49.20 in preparation for the Alysheba. John Velazquez, who was aboard for the Derby victory, has the mount and will break from post position three. 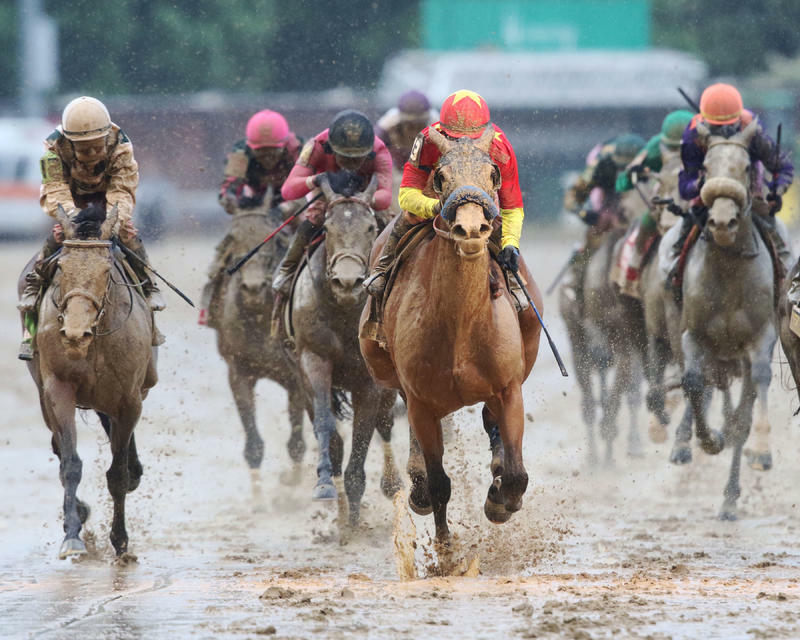 The field for the Alysheba, with riders and weights from the rail out, is: Good Samaritan (Joel Rosario, 120 pounds), Hence (Ricardo Santana Jr., 118), Always Dreaming (Velazquez, 118), Backyard Heaven ((Irad Ortiz Jr., 118), Hoppertunity (Flavien Prat, 118), Giuseppe the Great (Luis Saez, 118), Hawaakom (Corey Lanerie, 118) and Awesome Slew (Jose Ortiz, 118). Abel Tasman will be returning from a six-month layoff in the 33 rd running of the La Troienne for fillies and mares going 1 1/16 miles on the main track. The La Troienne will go as the sixth race of the day with a 1:17 p.m. post time. The most recent Oaks winner to come back the following year was Plum Pretty who returned to finish third in the 2012 La Troienne. Trained by Bob Baffert, Abel Tasman won three Grade I races last year en route to the Eclipse Award as champion 3-year-old filly. She finished 2017 with a runner-up finish in the Breeders’ Cup Distaff (GI). Mike Smith, who has ridden the filly in her past six starts, has the mount Friday and will break from post position three. 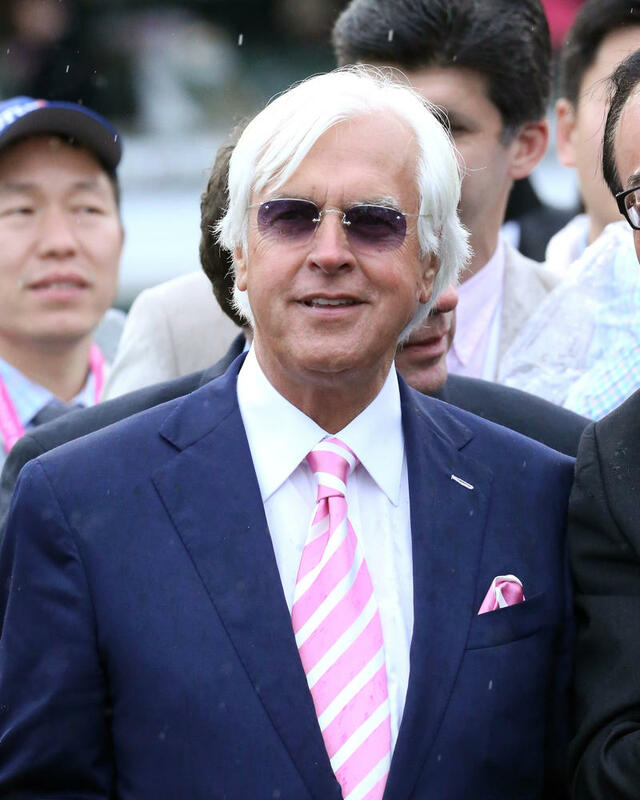 The field for the La Troienne, with riders and weights from the rail out, is: Salty (Tyler Gaffalione, 118 pounds), Farrell (Channing Hill, 120), Abel Tasman (Smith, 118), Ivy Bell (Javier Castellano, 118), Apologynotaccepted (Julien Leparoux, 118), Tiger Moth (Florent Geroux, 118), Streamline (Gary Stevens, 118) and Martini Glass (Paco Lopez, 120). 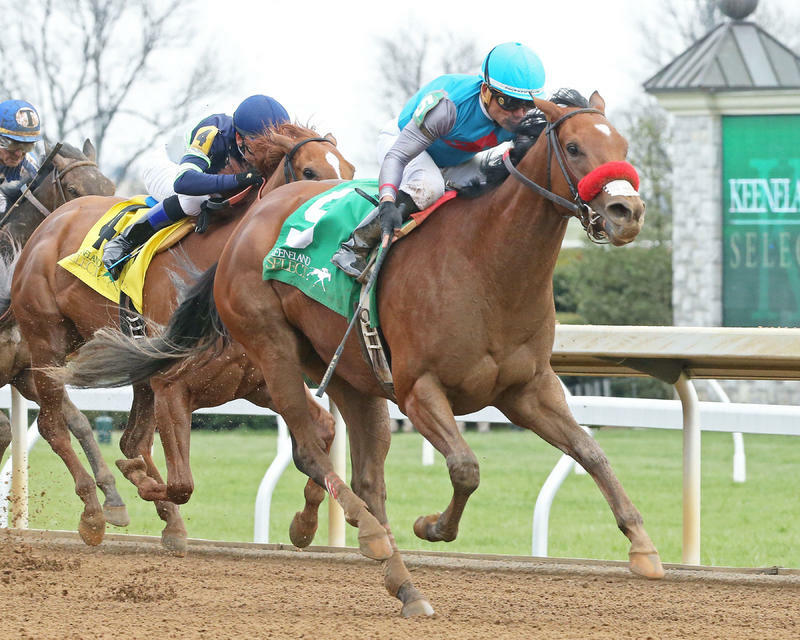 Riley Racing Stables, Justin and Megan Tackitt and Mike Hensen’s undefeated Gas Station Sushi, fresh off a victory in the Beaumont (GIII) at Keeneland, heads a field of seven fillies for the Eight Belles. The Eight Belles will go as the afternoon’s fifth race with a 12:35 post time. Trained by Richard Baltas, Gas Station Sushi remained in Kentucky following her Keeneland victory and is perfect in two starts. Corey Nakatani, who has been aboard both times, has the mount Friday and will break from post position six. The field for the Eight Belles, with riders and weights from the rail out, is: Amy’s Challenge (Gary Stevens, 120 pounds), Criminal Mischief (Luis Contreras, 118), Mia Mischief (Ricardo Santana Jr., 120), Salt Bae (Javier Castellano, 118), Talk Veuve to Me (Shaun Bridgmohan, 118), Gas Station Sushi (Nakatani, 120) and Hold Her Tight (Gabriel Saez, 118). 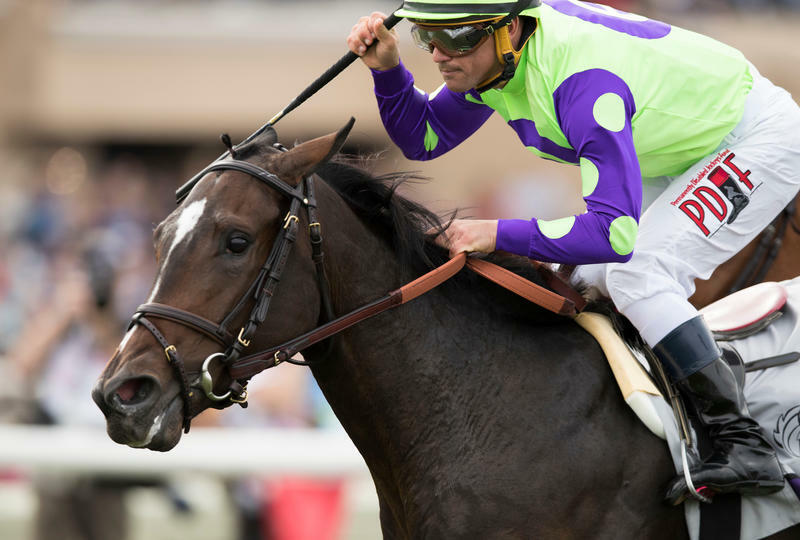 E Five Racing Thoroughbreds’ undefeated Rushing Fall , winner of last fall’s Breeders’ Cup Juvenile Fillies Turf (GI) at Del Mar, will face 10 challengers in the Edgewood. Trained by Chad Brown, Rushing Fall has not lost in four starts, including a victory in the Appalachian (GII) at Keeneland three weeks ago to start her 2018 campaign. Javier Castellano, who has been aboard for all four starts, has the call Friday and will break from post position 11. The Edgewood will go as the day’s 10th race with a 5:04 p.m. post time. The field for the Edgewood, with riders and weight from the rail, is: Got Stormy (Tyler Gaffalione, 118 pounds), Beyond Blame (Florent Geroux, 118), Altea (FR) (Jose Ortiz, 118), Figarella’s Queen (John Velazquez, 120), Bo Peep (Jon Court, 118), Daddy Is a Legend (Irad Ortiz Jr., 123), Toinette (Flavien Prat, 118), Beach Waltz (Joel Rosario, 118), Kabella (Shaun Bridgmohan, 118), Heavenly Love (Julien b, 118) and Rushing Fall (Castellano, 123). Ironhorse Racing Stable‘s Bucchero headlines a field of 11 for the Twin Spires Turf Sprint. The Twin Spires Turf Sprint will go as the seventh race on the program with a 2 p.m. post time. Trained by Tim Glyshaw, Bucchero won the Woodford (GII) at Keeneland last fall before finishing a close fourth in the Breeders’ Cup Turf Sprint (GI). Second in the Shakertown (GII) at Keeneland in his most recent start, Bucchero will be ridden by Fernando De La Cruz and break from post position nine. The field for the Twin Spires Turf, with riders and weights from the rail out, is: Delectation (GB) (John Velazquez, 115 pounds), Flashaway (Corey Lanerie, 120), Restless Rambler (James Graham, 120), Riser (Aaron Gryder 120), Latent Revenge (Joe Bravo, 120), Kid Perfect (Florent Geroux, 120), Vision Perfect (Paco Lopez, 122), Frisky Magician (Ricardo Santana Jr., 120), Bucchero (De La Cruz, 120), Will Call (Shaun Bridgmohan, 120) and Sonic Boom (Julien Leparoux, 120).